This Blog is dedicated to the home repair of digital cameras. Use the below search engine to narrow your search within the blog. And don't forget to also visit our YouTube channel! Simple Fixes for SD "Memory Card Locked" or "Memory Card Error"
If this information helps you, please pay it forward, and share this article with others who may be experiencing the same problem. Your help in sharing will be appreciated, and karma will prevail! For those attempting to recover lost or accidentally deleted photos or videos, see this linked article instead. For those who've simply forgotten their card's password, scroll down to the bottom of this current article. For those that have taken many previous photos with the card, but suddenly your camera or computer wishes to "format" the card, see the "corrupted card procedures" located near the bottom of this linked article instead. 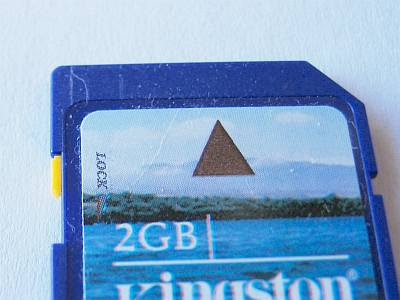 For those with Compact Flash (CF) cards, please see this article instead. Finally, for those that are still here with SD card problems, please continue reading. First of all, here's a video summary of the steps. But please remember to also read each of the Fixes listed in the article, along with user comments as they contain additional tips that the video doesn't cover. FIX 1: I know that you probably already have checked the card's slide switch, but I just want to first present this for others with the same problem who may not be aware of this switch. Other options besides the slide switch are presented further in this article. Please check to make sure that you didn't accidentally place the tiny locking slide switch on the side of your SD card in the "locked" downward position. The correct "unlocked" position should be slid up toward the direction of the connectors. If you discover that the locking switch is actually missing or has broken off, proceed directly below to Fix #4a. FIX 2: Old cameras and the card readers on older computers just can't read 4GB or higher SDHC cards. If this problem is just happening after purchasing a brand new card, AND your camera is an older camera (about 2008 or older), I'm going to guess that you just bought a new 4GB or larger SDHC card. If the above is true, continue reading. If not true, skip to Fix 3. Although the SDHC card looks exactly the same as a standard SD card, the format the card uses is very different. Unfortunately your older camera was likely designed before the SDHC format came out. Sorry, but a SDHC card may not work with your older camera (check your camera maker's website for your model). You probably will need to use standard SD cards only (usually those 2GB or less). They're relatively inexpensive these days, and can easily be found on Amazon if your local store doesn't carry less than 4GB cards. FIX 3: If you've had the card for a while, but it just recently started to show "memory card error" or "card requires formatting", ask yourself if you can ever remember formatting your card IN THE CAMERA. If you can't remember doing such (or don't know what a format is) continue reading. But if the description above doesn't apply to you, skip to Fix 4. An unformatted card will initially work fine in a camera, but eventually will corrupt with time, especially after many files have been saved and deleted. A card can also corrupt if camera power is interrupted during the write process (such as changing batteries or batteries dying while the card is still writing the last picture taken). Formatting the card in the camera will correct both these problems, BUT it will also erase all photos on the card. AFTER you've recovered any important photos (please see this other article from this blog that shows how to recover your photos from a corrupted card), format the card in your camera to prevent this from happening again (dig out your instruction manual to figure out how). Stating this once again, formatting will also totally erase your card, so only do this after you've recovered and saved to your computer any important photos from the card. FIX 3A: If file corruptions are occurring occassionally or intermittently (such as for every few files or movies taken, the camera states "file unrecognized" or something similar), take a close look at your card to determine its "Class", or in other words its write speed. Written on the face of the card should be the word Class with a number, or a number circled with a capital "C". See the above photo for an example of a Class 6 card (on the left), with an older/slower unmarked card on the right. If neither "Class" or "C" is written, the card is likely Class 2 or lower. Today's newer cameras take very high-resolution pictures, AND high-definition videos. File sizes can be very large. Some of the older SD cards just cannot keep up with the write speed required to save these files before you're ready to take another picture. As a result, some of your files can become corrupted if you're using older cards with newer cameras. The fix in this case is to purchase a higher speed card for your newer high-performance camera (recommend Class 6 or better). Or you can also wait a few seconds between shots/videos before switching modes or taking another picture (to ensure the write is completed), but that can get to be annoying after a while. FIX 3B: Again, if file corruptions occur intermittently, AND you use a card reader, do you remove the card properly from the reader? When ejecting a memory card from its reader, recommend that you always select the "Safely Remove Hardware and Eject Media". This selection is located in the bar in the lower right-hand corner of your computer screen (if using a PC). FIX 4: The famous "toothpick" fix (first presented here on DIY Digital Camera Repair). If you've tried the above techniques, and it's still showing locked, it's likely that the locking switch inside the camera's card slot is stuck. If you look inside the slot on the side of the slot where the SD card slide switch would be, you'll see a glint of gold color on the side. This is the camera's lock/unlock switch. The other glint's of gold that you may see at the far end of the slot are the reader's connectors (ignore those). Somehow, the locking switch is making contact and has become stuck in the locked position (a single grain of sand can jam it there). With a plastic toothpick, or other skinny NON-METALLIC item, tap and gently push against this switch to see if you can jar open the contact to its normal unlocked position. Also try blowing compressed air at it, to clear out any gunk that may have worked its way in there, jamming it closed. Occasionally, reinsert the SD card to see if the issue has been corrected. Fix 4A: The famous "tape" fix (sorry, I can't claim this one). If none of the above seems to work, or if you've found that you've broken the locking tab on the card, one final thing to try before opening the camera is good old tape. Cut a tiny piece of clear cellophane tape (use scissors to trim it), and place it tightly over the slot where the locking switch is, or was. I can't stress it enough, keep the piece of tape small, you don't want to jam your card in the camera. Now slide the card into the camera. If you encounter any resistance, STOP, the tape is likely too thick or too much. But if not, proceed and see if that corrects the problem. 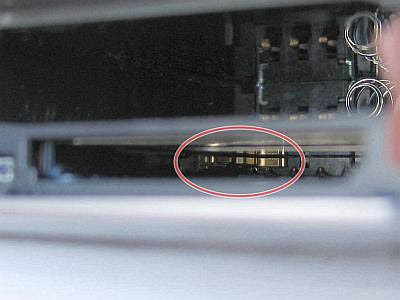 FIX 5: If you've come this far and you're still getting a "card locked" error, it may be time to consider opening the camera to force open this switch, or to inspect its wiring (not recommended unless you have some familiarity with electronics). In this case please see this blog article instead (xscrewdriver, hope you don't mind me referencing your blog). Forgotten passwords can be recovered using the following procedures (from kioskea.net). 5. Your password will be located within that file. Put the card in any E series mobile or N95 etc and format it. It will not ask for a password. Ended up doing a "Reset All..." from the settings menu. My camera was working fine until today. I had taken photos this morning no problem. Then later today I turned it on again but it said I had no memory card installed. I did! I thought something must be wrong with my card so I popped another in and got the same result. Tried a 3rd card and got the message again! What the heck could be wrong? It has not been dropped nor gotten wet or gotten sand inside. Did you try Fix #4? It doesn't have to be sand, just a piece of dust can do it. Just give the switch a little tap/jostle with a toothpick. Tried Fix #4 but didn't work. Canon says I need to send in for repair but it will cost $89. That's a little pricey in my book. There was a glitch that I remember in older S400 Canons that caused this problem when the camera's clock battery ran down. Does your camera model have a slide out battery door that allows you to change this battery? If so, try popping it out and reinserting it to see if it corrects the problem. Also another thing to try is removing the batteries and then the card. Then start the camera without any card installed. Sometimes that can reset the camera. I'm going to try replacing the date battery. Hopefully that will work! I tried all of this when I had a "memory card error" message on my Panasonic Lumix due to not formatting then deleting pictures via the camera (my diagnosis) but none of the fixes worked. Bother my computer and the recovery programs recognize that my memory card is in the drive, but not that it is/contains anything! What can I do to retrieve the pictures? Your diagnosis sounds correct. But it unfortunately sounds like you may have conducted a format of the card before running the recovery software. If this is indeed what you did, this would correct the card error problems, but unfortunately would make any photos unrecoverable, even with software. You can possibly give it one more try with deep scans using Pandora or PC Inspector (please see this article), but am sorry to say there's not much else that you can do. Replaced the date/time battery but unfortunately it didn't work. I guess I'm out of options. I had the "No Memory Card" error after viewing the photos in my laptop. Since the card wasn't recognized by camera, I couldn't use it to format the card. I tried formatting the card with the computer as "FAT (default)" but still got the no card error. I retried it in the computer formatting as NTSC, after which I got "Memory Card Error." Now that the camera recognized the presence of the card, I could use the camera to Format, and all is well. Thank you so much. My Canon Rebel Xs had the same problem, saying card write protected, but i tried many different memory cards and still no luck. But now i used your tip with the toothpick and it worked :) Again, thank you, your a life saver, and also a big money saver. I've been trying all these solutions but none have been working for my Samsung NV9 Digital Camera. It is really starting to get on my nerves. I've even opened it up to look at it. All the wiring is the right places and don't look damaged. I have 3 different SD cards. I think i probably have a defective model. I have a FUJIFILM FINEPIX S1 PRO. The camera felt down and I'm having issues with the mirror. I tried to repair it. However, I haven't been able to set the mirror in its right place. It doesn't move as it is supposed to. The camera displays an error in the screen. It does autofocus (I repaired it) now. Any ideas? Where can I get the reparation manual or some documentation the explains how to fix the camera? In my country there are not Fujifilm dealers/support, so I need to do it on my own. My camera wont let me format in the camera. Ive tried taking the batteries out and reseting the camera but all its says is "camera busy." Trying to put the card in my computer too roughly iv managed to snap off the protective blue plastic covering just on top of the lock switch. The tiny piece of plactic above the lock switch and next to the gold strips had come away. Iv found the broken piece and can sit it back in place perfectly (so there is no lost bits) but obviously cant stick it. The computer and camera wont read it coz its not the right shape anymore. What can i do? Sticking it with tape blocks off the gold strips so the somputer cant read it and wouldnt glue possibly clog up the innards? Thank you! Blowing some air inside my camera's slot fixed the issue I was having with my Canon Powershot A590. I didn't know there was a locking switch inside the camera. Forever grateful for this tip of the toothpick !!! It didn't work at a first try, so I thought the little sensor had been broken somehow (it looked odd) but after a couple of minutes something happened and the camera works again ! It works !!! Thank you very much ! I did every thing you said, even the air and the stick thing. I tried and finally the camera DMC-TZ5 recognized the memory card again. You´re cool man, thanks for share your knowledge. The tape on the locking card slot worked great. Thank you for this website! I dropped my Ixus 95 last week. The impact caused the plastic bit that locks in the CF card and battery to become trapped in the metal outer shell. To my knowledge, it was kind of still working at that point. To release the plastic battery cover, I carefully took the screws keeping the outer shell in place and angled it slightly so I could pop out the battery cover. I was fairly sure I put the right screws back in the right place, everything seemed back to normal except for a few scratches. I turned the camera on and a warning read 'Card Locked!'. I never flicked the 'Lock' switch on the SD card. After a week, it began working again, so I tested it by removing and re-inserting the card and I'm back to the original problem. Does anyone have any ideas about what's gone wrong or how to fix it? The internet's not coming up with a whole lot for me. Are you using a portable reader? They do on occassion go bad. Would suggest as a first troubleshooting step, checking with a new card reader as they're only a couple dollars or less (check on Amazon).
.: I'm going to go buy a need reader today and I'll let you know how it works out. I received Memory Card Error on my canon camera. This happened after I used tape and the trick did not work. There is no USB reaction if I insert it in a USB memory card reader or a self contained reader found in netbooks. If I format the card in camera, will I be able to recover those photos with a recovery software after the format or are there other hints to try. Right now I can't do anything with the card, except stare at it in anger. I had the "Memory Card Locked" with a SD card a while ago; it turned out the lock switch was so smooth-running it got pushed into the "locked" position by just inserting the SD card into the camera or any card reader. I fixed the lock switch with a drop of superglue and the problem was gone. Have you checked the little metal contact points on your card for cleanliness. If you see any discoloration, try cleaning them with a cotton swab dipped in rubbing alcohol. Don't recommend formatting unless you've recovered the photos from the card (see the other article on this blog concerning recovering lost photos). Hey, thanks so much for this blog. Just solved all my problems. 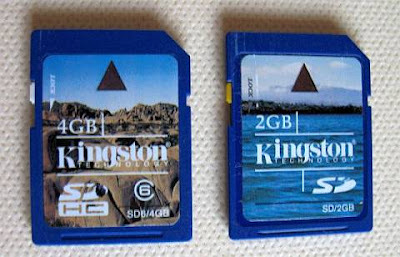 SD vs SDHC in my old camera. I can stop fretting now. I have a Cannon Powershot digital. Pretty new. I tried all the steps. i thnk i tried too hard to switch it. Is my last resort sending it in now ? because i think i damaged it too much. at fisrt it would say card locked. But now it's saying no card inserted. THANK YOU!! I was just about to go drop $40 on another SD card, but thanks to your advice I fixed my SD car myself!! Had to use tape for missing lock switch and it is working well again! God bless you. Thank you very much. The cellophane tape trick worked magic for me. My Panasonic Lumix DMC-FZ28 Camera the ScanDisk is inserted, but comes up with: This memory card is locked and won't allow me to take any photos, nor can I remove the disc from camera. After messing with the little lock with a tooth pick the camera read the mem card....WoW. I am so glad this site and your help are here. Yey the toothpick trick worked! I've been 'thinking' about sending the camera off to canon for about 3 months. I asked at several independent camera shops and Jessops if they had any ideas to fix it and they all just said 'send it to canon' without even looking at it. Thank you so much!! OMG! The toothpick solution worked the first time I tried it on my Canon PowerShot A560. I was receiving the "No Memory Card" message when I inserted the card. Thank you for saving me much money and grief! Oh my gosh thankyou!! My son was playing with the camera this morning and suddenly it was saying card locked. Googled it and found your site. The toothpick thing worked! Thanks again! hello ..can someone help me to get my SDHC card to work cuz i broke the lock thing ..by accident. opss!! ..anyway ..and my camera still works but the problem at my card everytime i open it it says ..THIS MEMORY CARD IS WRITE-PROTECTED :S and i dont know what to do ...HELP PLZZ ! Please read Fix #4A in the above article (the one that uses a small piece of tape). A piece of tape over the slot should work, even if the original lock switch has been lost. 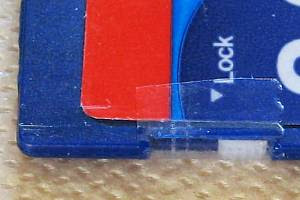 Just remember not to use too big a piece of tape as you don't want to jam your card in the slot. Thanks For your suggestions, it was the clip inside the camera that apparently was stuck. I used a paper clip kept a little hook on it and fished it back out. The first time I reinserted the card it was very tight and actually stuck after i took it back out and reinserted it, it was back to normal. I was quoted 159.00 to fix it yesterday at Wolf Camera here in Georgia. My camera was working fine when i turned it off cuz i wasnt taking picsno more then when i turned it cak on it said "This card cannot be used" idk why its not letting me.! its a 4GB SDHC card.! i need help.! is there anyways i can recover my pics.?! See this other article to help recover your pictures. You may need to get a card reader to use this software though. It was my birthday today... got a new memory card out, and a lot of pictures were taken throughout the day. Then, I got the 'Memory card locked' error. I turned the camera off, then on again. It worked fine, so I thought nothing of it. I passed the camera to my mum, and after she took a picture, the 'memory card locked' error came up. It's been like that ever since. Other cards work in the camera, but my camera and other cameras (or computers) don't recognise the card as having any pictures on it. I want these pics back, but nothing seems to work. Is there hope? Even if I need to fork out a load of money, I just want these pics back!!! It should be relatively easy to get the pics back. Please see this other article on this same blog. You will need to use a card reader with this software though. If you don't have one, get one, as they're only a few dollars on Amazon. Finally, this likely occurred because you may not have format the card IN THE CAMERA when you first got it. It will work fine at first but almost always corrupts when many pictures are taken. Format the card AFTER you've recovered your photos. FORMATTING WILL ALSO ERASE YOUR CARD, so again only do this after you've recovered the photos. "Taped Locking Tab Slot" did solve my problem! :) Thanks a lot! This post was great! I was taking pictures and then my camera goofed up, saying that there was no memory card. After learning that there was a switch inside the camera, I wiggled the SD card about and the camera detected the card! yay! I had this 'Memory Card Error' problem this week.. just when I needed it. I tried blowing air into the card slot, but it didn't work. The switch on the card is also unlocked. What should I do? Help! God bless the internet for advice like this! "Unlocked" like a charm! THANK YOU! It worked man. I used an toothpick and in no time the error eliminated. Thumbs Up! I never would have known about the little "lock switch"...Thanks!! I just received a new 16GB for my new Canon IT2 camera. It gives us an error and says the card is locked. We unlocked it on the side, but still are getting the error. My other card works just fine without any problems. What's the cause of this? This really help my problem. OH MY GOSH !! THANK YOU !!! It worked like a charm (used a tiny hard stick from a fruit tree had no toothpicks but couldn't wait) that made sense to me as I could hear it when it came loose or locked or whatever and I felt I could just push it out of the way but tried the wrong side. I have three cameras like this so I am VERY happy. I hope I can fix them all. You da man or woman. Thanks again ! Hello, my camera is telling me to format my memory card, and when i click that option it then tells me "memory card error" and won't let me continue the process! please help! God Bless You!! I was getting a "memory card locked" message when it wasn't locked. I bought a new card. Got the same message. The toothpick trick worked!! If all the above doesn't work, try updating the firmware - I had this problem on my canon 1000D and apparently the 1.0.7 firmware update fixes this problem. It did for me. Also try reformatting the card again after doing the firmware update. It works. I tried everything to fix my sd card. I came upon this blog thank God, I downloaded the recuva program and used a card reader because my computer wouldn't recognize my camera or card and presto all of my photo's were recovered and i only lost one short video because it was corrupted. Thank you so much!!! It turned out to be the card lock switch inside the camera on my Canon Ixus 100iS. Thought it was the card, until I tried another card! Many thanks for your tips! Thank you so much for your tips! The toothpick tip didn't work, but amazingly the tape trick worked! lucky to find a very thin smooth surfaced tape. thanks a lot. These things always seem to happen on the way to catch a flight! Great image of the locking switch. Tape did the trick. I had just used my memory card in my iMac and when I returned it to the camera the card locked . Thank you so much! Another disaster averted. My Memory card is an SD one like in the pictures, but does not have a 'lock' switch and never has, there is also no writing or gold to indicate there ever being one. My memory card has worked for a while without breaking but now it is saying it is locked. It also will not allow me to format the memory card because it is locked. HELPP? 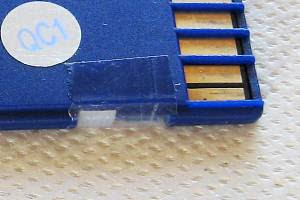 A card that looks like an SD card, but without the switch, is called a "MMC" or "Multi-Media card". It's similar to SD, but uses a different format. Most cameras that utilize SD, can also use MMC cards. I said most, but unfortunately not all. You might want to first verify that your camera is capable of using MMC cards by checking its specifications, either in its user manual, or on its maker's website. If you can't find this info, try a different memory card (preferably a 2GB SD card) in your camera to see if the problem is particular just to your card. If the camera works fine with a different card, then your camera was likely not meant for MMC, or your MMC card is defective. In either case, there's not much that you can do other than to use SD cards only. But if the camera also has problems with a 2GB SD card, then it's likely that the switch inside the camera's slot is stuck. In that case, the final thing to try is the toothpick fix listed in the article (and again ONLY AFTER you've tried a 2GB SD card). Thanks for the great suggestions here. I tried several of these suggestions but in my case, here was the fixed: the "memory card locked" error seems to be a *spurious* error message, that occurred because I pulled the data cable out of the camera (after uploading pix) but apparently before it had internally disengaged from the data transfer process. Nothing I did to the physical device affected the error message. However, when I plugged the data cable back in, *then* I was able to get into the Format menu and wipe/reformat the memory card, and that solved the problem. Toothpick trick worked a treat. Many thanks. the memory card in our Canon powershot SD 780 began saying "Camera Locked! ", out of nowhere... then, randomly I can turn the camera on and the "Camera Locked!" is gone and it works, yet the moment the camera is turned off again and then turned back on right away it says "Camera Locked!" again... and it is not fixed by turning 'off and on'... it will only work spontaneously now. I tried the tooth pick trick, not sure if I am doing it wrong or not... what do you think the problem is? we bought a new memory card and it still says "Camera Locked!" ... we tried the tooth pick trick and the gold part is not popping back out far enough. If this is busted somehow, how do we fix this? Is it an easy fix? Thanks for any advice! I wasn't able to do this on my own. I was wondering if I could send this to you and you could fix it for me? Please let me know. My husband and I recently baptised our 3 yr old. As I was trying to save the pictures, It asked if I wanted the protection mode on, and I said yes, Now I dont know how to see my pics, cs my camera is freezing up, and it wont let me use the arrows, or see the pics on my card.. I keep crying cs I dont have a manual, and Im hoping I didnt loose such valuable pictures. Please help me, I cant stop crying. I'm sorry about your camera. I'm not familiar with your particular model. But your pictures should still be on that memory card. First thing I recommend is that you remove that card from the camera, and never use that card again until you've recovered the pictures. See this other article on the blog which will show you how. You might not even need to use the listed recovery software. You might only need a simple and inexpensive USB cheap card reader to download your pictures. You insert the card in the reader, insert the reader in a USB slot, and the card should show up as a drive that you simply copy and paste the pictures onto your hard drive from. I cant thank you enought for fix number 4. My camera stopped reading cards during a trip to canada, and has been out of service for months. i used compressed air and everything seems to be working fine now! But my Olympus, will suddenly appear with "image error" as I go to look back on my photos, and when I plug it into the computer the memory card is empty. This is infact how I lost my fathers funeral video. It happens on a regular basis. Is it possibly the card? Could fix 3 possibly be the best solution? Ask yourself, did you ever format that card in the camera as Olympus recommends? If the answer is no, then I'm almost positive that is your problem. After saving all your photos to your computer, look for that format feature in the camera's menus. Before and after you format, try some of these recovery software. You might get lucky in recovering some of your lost photos. One other thing, when you're ejecting the card from your computer, recommend that you always select the "Safely Remove Hardware and Eject Media". It's one of the selections in the bar located in the lower right corner of your computer screen (if you're using a PC). Thanks for the excellent advice. My Canon SX10 started showing "No memory card" message after 2 years of use, & 4 months of a new 8GB card. I downloaded pictures as usual, and BOOM! the message appeared when I reinserted the card. Upon reading this post, I tried using a toothpick, & the card worked just fine after the first try!!!!! Fantanstic, did not know about the swtich at the bottom of the slot. Only one suggestion, could you also include a picture of what the slot should look like when in the two (locked & unlocked) positions? Being such delicate electronics, it would help to know what to watch for. Thanks a million again, I am to leave for an extended trip in 2 days, and your post helped me from despair. I’m having the problem with my Panasonic DMC-FZ18, getting "READ ERROR PLEASE CHECK THE CARD " in video play back mode. video play well for some time ( 15 sec ) and then stop suddeny with "READ ERROR PLEASE CHECK THE CARD " error. Not sure what the problem is , my cam is 2 yrs old, earlier it was working fine with same card. 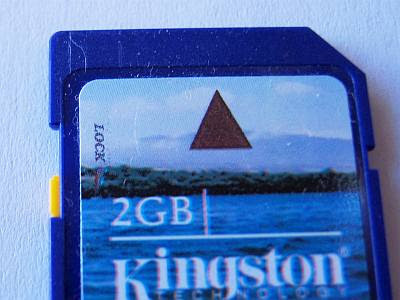 I’m using a standard Class 2 Kingston SD card (2GB). Laugh out loud. It couldn't format my micro SD card, I did everything but aside from using an eraser. After an hour I finally decided to Google it and found out all I had to do was move the little teeny lock switch. I sure laugh. Thank you very much for the help. Toothpick worked on my coolpix 51 just like the others coming from out of the blue staying write protected. The toothpick trick worked on my Canon A450. Tapped the switch a couple times and it read the card. Google took me here first and I'm glad it did. You're trick saved me a lot of time. I have a card error on a SD card from my camera. I insert the card into my F: drive on my laptop but is not found. Would a card reader be different then the F: drive on my laptop? If your card is a 4GB or larger SDHC card, AND your laptop is older than a couple years, chances are that its card reader will not recognize the new SDHC card format. If that is the case, simply purchase an inexpensive $2 USB SDHC card reader from Amazon (one similar to these). As always, remember to check the reviews before purchasing. The card is a 512mb.I bought my laptop last year. I was able to view the card on my laptop before the error message on the camera. Would the card reader still help to retrieve the photos? No, if it worked in your computer before, then the next likely cause is that the card has become corrupted. Next thing to try is the "Corrupted Card Procedures" located at the bottom of this linked article. Recommend trying to format the card in your camera, using the camera's "quick" format feature. Then using the listed recovery software with your computer and its reader to recover any photos that you may want to keep. I gava a lock code in my memory card by my nokia mobile.but somehow i forget it,so what can I do to retrieve my memory card?? Thank You for the tips. My card wouldn't stay in the slot, I took a peek into the slot with a flashight and I found a small piece of the plastic from the old card had broken and was lodged inside. I took a long skinny handled tweezer and dislodged it, the new card went in perfectly and my new card works just fine!I just saved myself a ton of money for such a simply fix! My camera worked fine up until just before my sons birthday. i have used the same card and had no problems, then all of a sudden it says "no memory card" i tried my mother in laws card and it said the same thing, my card worked in her camera so it is clearly the camera. I have tried everything and can't fix it. SD card won't stay in the slot of my Panasonic Lumix DMC-SL80. When SD card is placed in slot will not stay in place. It keeps popping back up. If I push it down manually and close cover, camera will not read the SD reader and only uses internal memory of camera. A reading saying "Memory Card Error-Check Memory Card" appears on the screen There is nothing wrong with the card, it works fine with other cameras. Wow! It’s really great demonstration. Thanks for put on view. Please Please help me , i'm using a canon PowerShot A470., my memory card's lock tab broke and when i insert it in the camera it says 'card locked' i tried my other memory card whose lock tab isnt broken its giving the same message i dont know why, i tried the tooth pick fix and tape also ., NOTHING works ;( PLEASE HELP ME , YOU'D BE A LIFESAVER PLEASE !! THE TAPE WORKED FOR US!!!! Thanks, my son was really distraught that his camera was busted. you're genius! the toothpick suggestion worked! I have 3 x 16GB SDHC cards and two from Adata had cracks. I went to their website to complain, saw customer service and figured never hurts to complain to them. They sent me 2 brand new cards. Most Brand makers have lifetime warranties now. for small cards like a 2GB might not be worth the trouble. But I spent an hour or so and postage. I sent in class 6 and the cards sent back SAY class 6 but are Class 10. Blondie, sounds like you camera might have static charge built up. Take out cards, take out battery, push power button (of if there is a mechanical switch turn it and then push the shutter (take a picture) button a few times. That should discharge any built up static charge. THANK YOU SO MUCH! You just saved my life in less than 2 seconds! Toothpick worked!!!! Husband will be bummed, a camera was my Mother's Day gift! I like my old Canon! Hello, earlier tiday I had posted a cmmentand now it's gone. It was co.cerning my 16 gb mini sd sandisk getting corrupted while beimg used in my samsung straight talk phone. It had been used in my htc phone prior and had worked for 3 days no prob, had not formatted or changed anything. Then I saved a pic from the web and it messed up. The card isn't read by my.computer and I would really like to retrieve tje dats that was on it. My email is generic3@msn.com. Please help and thank you so much. Your videos and blog were the best and most informative, which is why I'm asking for your help. Canon PowerShot A460, old cheap camera but I use it for snapping pics of projects around the house. It's been working fine until last night, I took a few dozen photos and then it started giving the No Memory Card error. It did this with all my cards (they all work, none are Locked). I tried the tape thing first, didn't work. Then I tried touching the little gold piece inside the camera and it worked! OK I have the card locked error for my 16gb Transcend card in my Canon SD780IS. I have used this card for years, never a problem. Yesterday out of the blue I get the locked card error, and I also cannot get any of 3 computers and 3 card readers to read the card. I have a ton of pictures I just took on vacation I would really not like to lose! The tab on the card is not in the locked position, and other cards work fine in the camera, so it is definitely something with the card. Tried 2 recovery programs and none see the SD card either. Am I SOL? Thank you for this blog post! I never would have realized that there was a difference between the SD card and the SDHC card. I have an older camera and thought the new SD card I bought was just stuck on lock, bought another card tonight and the same thing happened - got the memory card is locked message... I read your post and put my previous 2gb SD card in and my camera worked fine, so now I know I need the older SD cards. Thank you sooo much! When a card suddenly becomes unreadable, it's likely to have become corrupted. In such cases, it may be necessary to conduct a "quick format" to enable the card to be readable such that photos could then be recovered using photo recovery software. See the "Corrupted Card Procedures" located near the end of this linked article. THANK YOU!!!!! The toothpick fix worked. It took a few tries as I had to gain confidence to give it a gentle but good push Merci! Thanks.... For me it was the SDHC/SD question. But I really appreciate your post... You saved me a camera that is an old friend. It may be an older camera, but it has a viewfinder and I take it everywhere even when I don't want to risk my DSLR. Thought I'd treat it to one of my new high capacity cards, but of course it didn't work. There was nothing on the Canon support site that helped me figure out the problem. I have a new canon sx40 and I took the memory card out to put in another. But now neither card will click in place or stays in. That sounds like an issue internal to the camera card slot. That problem is not something that you should try to fix yourself. A new SX40 is likely still under warranty. Rather, recommend that you call 1-800-OK-CANON and request warranty repair for. That camera isnt cheap as well, i even bought a new 16 gb card, because the switch wasn't the problem, i dont know what to do anymore, i dont want to take it to the repair too, too expensive i assume. Thank you so much for your detailed instructions! Unfortunately...my Cannon Powershot SD400 is still reading "No Memory Card". I was unable to reformat because it it blacked out on my menu. Any suggestions? I inadvertently put in an SDHC card (not knowing it would cause a problem of incompatibility) and not no matter what card I put in...I continue to get the "No Memory Card" alert. Thanks in advance for your help. Sounds like the internal switch may be gummed up. Why not try the toothpick fix #4a. This video shows how to do it. 2. in camera formating avoiding the low level option and to try and recover using the recommeded software after the formatting step. The problem with option 2 is that checked and followed the instructions in the manual for formatting the memory card. It bypasses that step in the menu selection, you can see it but it won't let you select/activate it, the selector skips it. So I can't even see what the formatting options are, nor can I activate it. Recommend trying number 1 first. If that doesn't work, try number 2 using your computer to conduct the quick format as shon near the end of the recovery software article. Recommend trying the toothpick fix as shown in the video. The internal switch in the card slot may be jammed. Re: Canon SX150IS - Your instructions & video have been great, learnt a lot and am sure it isn't locked, despite what the camera says! Sometimes a card just totally fails. In that case, not much that you can do. Final thing that I always try before hanging up is to first check that the card connectors are clean (look for corrosion or spotting). Finally, I give one last shot formatting using SD Card Formatter (a freeware program from SDcard.org). If that doesn't work, you've done all that you could. The next step is to consider physical recovery services (they open up the card). But that's somewhat expensive, and still no guarantee that they'll be successful. Might want to also try Zero Assumption Recovery, it's free for photo recovery. Here's more info. i ve put the sd card in the wrong side and it got stuck , after strugling to take it out i somehow managed to do it but it came out broken . when i ve tried puting a new sd card in it was saying no sd card inserted. i ve send it for a repair at Nikon Uk but the estimate fee was £167 which is too much for me. I have ordered the sd slot replacement but i cand find anyone to replace it because apparently it needs a factory adjusting!? has anyone had the same problem? I really hope you can help me i have a nikon coolpix l110 i tried all your above fixes none of them worked for me:(. if i go to turn the camera on regular no issues without a card in it i can take up to 14 pics i believe it is with internal memory. but if i go to put in a memory card it says this card can not be read everytime. i have tried two diffrent cards a 2gb sandisk and a sandisk ultra 16gb 30mb/s sdhc but with no luck:( help????????? I just used the plastic tooth-pick method on my Panasonic ZS10 and it now works fine. Thank you for the directions. I just used the tooth-pick method on my Panasonic ZS10 and it now works correctly. Thank you for your hint for unlocking the camera. I recently encounter an SD memory card error while the card was inserted into the camera. I would insert the card into lab top and it would not read card. I tried different card readers and evening tried reformatting the card in the camera. I tried many recovery software programs to recover the photos with no luck. I came across a company named recoverfab. After seeing their process to recover the photos and all the success from customers this was my last option. I made contact with the company and gave me detail instructions on how to mail them the SD card. Once he received it he emailed me notifying me that he had received the card and would complete the process within 7 days. He emailed the next day that the process was complete and with instructions how to view the photos he recovered. Thank you for your blog. It fixed my memory card error. This really fixed my SD card! This was really helpful, and saved me a lot of time trying various other ways to fix my camera problem! Hi, that was a really interesting article. It didn't actually assist me with the problem I'm having, so just wondered if you have any ideas. Bought my wife a KitVision 15" digital photo frame for christmas...we have about 28gb of photos, so i bought a SanDisk 32gb SDHC card (speed is 4). I transferred all our photos onto the card (my computer can find them all on the card), but when I put the card into the photo frame, it only reads the last few folders (just over a 1000 photos and around 2.5gb). Any thoughts why the frame can't find the rest of the pictures...it also skipped over a folder of scanned pre-digital pictures and doesn't show them either. Can't figure it out and we're getting very frustrated with it - any ideas? Thanks, Mark. THANK YOU, THANK YOU, THANK YOU!!!! I had NO idea that there was a lock on my SIM card!!!! You have saved my cruise!!!! God Bless!!! Thanks for your very helpful guidance & fixes, which I looked at yesterday when I had an 'unrecognised' SHDC. It simply turned out to be a re-boot was required, which I suggest you might consider adding to your fix list? Hi there, My Panasonic Lumix DMC-FS41 just won't recognise the card. It always says 'Pictures will be recorded to the in-built memory.' So I can't format the card internally. I have formatted it in a PC, and the card is fine, but the camera won't recognise it. I've also tried another card in the camera and it doesn't give the option of saving to card, just the standard 12 pictures on camera memory. Any ideas? PERFECT. I tried reading the maker's manuals for 15 minutes to no avail but then I found this marvelous blog and solved my problem in a minute! Just as easy as reformatting the card IN the camera. amazing! the #4th toothpick technique really works! after trying several times with a paperclip (metallic but covered it with paper & tape), it worked! tks Camera Repair! Fix 4A is working great!!! Thank you! I found your blog searching for a fix on my digital camera - fix #4 was exactly what we needed. Thank you so much for the advice! Your are a genius!!!! Tape fix worked for me -sometimes simple solutions are the best- :) Thanks a lot. Thanks for the help, this side is just great. I got a new camera and it just shot down displaying "busy". Your tips and these from a commenter near top solved this problem. I formated the card on my PC, afterwards the camera recognizes it as a memorycard and can format it without any problems. New Canon I kept getting 'memory card error'. I had to buy the memory card, it came with 2 cards, but the larger card is not a card, it is the adapter. You must insert the mini-card into the adapter, then into the camera. That fixed it. Also, be sure your adapter is not locked, if it is, unlock it by sliding the tiny tab in the other direction. Sheesh. Hello, thank you for the advises but for me no one of them is working. I hope someone will read my coment and help. Hi. My camera model is Canon IXY 31s and memory card is Patriot LX Class 10. I accidentally deleted some of my videos on my memory card and I tried to recover my files by some recovery software. I couldn't recover my files, but now I have another problem; when I insert my memory card in my camera,it shows "no memory card", however, my pc recognize that card. I've tried all of the formatting type via my pc but still have the same problem. I've tried the other card in my camera, and the camera worked again, but it is essential for me to solve the card's problem. I have a problem with my camera. I used it just this morning and took pictures, and then transfer it to my computer. Later, when i turned it on again and took another photos, it was functional and then turn off again. i tried to take another shoot, suddenly a red text saying 'memory card is right protected'.the pictures taken can be viewed but the taking pictures is impossible. I tried to fixed it out, but nothing happens good. Please help what to do. thank you! Thank you so much!! the toothpick worked for me! so glad this video exists! I got a memory card locked error message on my camera and after a bit of panic, found your wonderful, clear and concise blog. Thank you so very much. I went into the Panasonic website and found out how to reformat my card and now all is well. Thank you again. I posted a link to your site on my facebook page so all my photographing friends would know about you. It is very rare that I find a fix online that actually works. Thanks so much! Wow that was actually a great tutorial, kind of saved my life for prom! Thanks! The little plastic piece to lock/unlock my SD card popped off at work during a goodbye party for someone leaving-- found your site and after using good old scotch tape I kicked myself for not figuring that out since that is how I used to record over on VHS videotapes back in the dark ages. Some things just keep working--I was able to retrieve all the photos. Thanks for the site article! Hi, my card won't read at all. I put it in the camera and it says "no card". I didn't realize until I took the memory card to Walgreens to have some photos printed. Their machine couldn't read the card. So I brought it back home and put it in the camera and it says "no card". it is a 64GB. How or where can I take to have this card restored. It is not locked. I put it in a reader and it won't read it that way either. It just doesn't show up as a device plugged into my pc. Really important pics on there. Please help! Toothpick fix worked for me too. I have tried looking at numerous sites, including Canon, but your fix did the trick. Thank you SO much!!! I am bookmarking this site. Excellent! Toothpick fix worked for me. I have looked at numerous sites and tried several fixes to no avail. I am SO thankful for this site! I have it bookmarked. Thanks SO much!! Thank you! Fix #3 solved the problem. So I just bought a double pack of PNY Premium 2GB SD Cards to put Super Smash Brothers Brawl: Project M (Version 3.6) on one of them. (It is the hack less version). About 30 minutes ago, I tried placing the file on there and it said that it was write protected. It did the same with the other SD Card. How do I fix this problem? The toothpick worked. Thank you so much! Thank you very much! The toothpick worked. I cant believe it! Thank you! Taping worked for me. I have a canon rebel t6i purchased 7 months ago. Last week started getting memory card locked message on camera for both cards. tried cards on another camera and it was fine. Tried the tape idea and the cards work but that means the problem is in the card slot in the camera, right? I've tried a toothpick/flashlight and I really can not see much inside. Thank you for this blogspot. Any advice? Looks like I have too new of a SD card for my printer. I just got a new digital camera and my mom got me a new SD card. I am trying to save a PDF to my new card, and my printer is mad! I have to reinstall all of my printer software. YUCK! ;-) Glad things worked so well for you Joy. :-) He says in the blog you can find these cards on Amazon. THE BEST WAY TO SHOW YOUR APPRECIATION is to share this resource with others who may be experiencing the same problem that you had. You may have seen them in the search that led you here. If in your surfing of the internet you come across others experiencing similar problems with their camera, please be kind and direct them to this site. Oh no! You've dropped your digital camera. And it's out of warranty. And repair costs more than the camera is worth. What to do short of tossing the camera (or selling on ebay)? Well, believe it or not the average person has a good chance of diy fixing that camera themselves. All they'll need for most cases is some patience, and a little background knowledge. The intent of the posts on this blog are to help provide that knowledge. But now for the WARNINGS! Many of the repairs posted here should only be considered as a last resort for a broken camera that would otherwise be considered for disposal. Also please consider those repairs that require removing the camera case to also require some electrical background and knowledge, and should not be attempted by anyone unfamiliar with basic electrical components and safety precautions. Make sure you read this post and are aware of the potential DANGER OF SEVERE ELECTRICAL SHOCK should you decide to proceed with a "do it yourself" repair that involves removing the camera case. WHAT YOU READ HERE IS NOT PROFESSIONAL ADVICE. Most of the posts and comments in this blog come from amateur repair hobbyists (INCLUDING MYSELF). Take the advice with a grain of salt. YOU MAY ACTUALLY MAKE MATTERS WORSE by following what you read here. Many of these repairs will almost certainly VOID YOUR CAMERA'S WARRANTY. It's ultimately YOUR RESPONSIBILITY should YOU DECIDE to try some of the repairs posted here. Did this blog help you fix your camera? If You Had A Lens Error, Which Fix Worked? Which freeware photo recovery software worked best for you? Repair tips for digital cameras that won't power on. Important Warning: Camera Flash Capacitor Shock!